Tall and distinctive, the Midland design is the perfect addition to any front entrance. 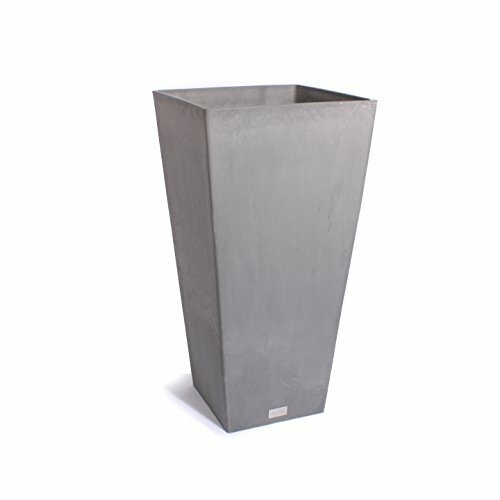 Characterized by a marbled finish and a modern, sleek square tapered design, the Midland planter is ideal as a patio accent or flanked along an entrance wall. Molded from a patented plastic composite, all Veradek planters are extremely durable and designed to survive all seasons. Midland planters are flexible, impact resistant, sturdy yet lightweight and specifically treated with UV inhibitors to minimize fading. All Midland planters come equipped with a removable shelf set 13 inches below the rim of the planter- this provides the user the versatility of fully filling the planter with soil or using an interchangeable plant insert. With a Veradek product you can rest assured that you are receiving the perfect balance of design, durability and convenience.